Since my college and grad school days studying clinical psychology, I have been consistently struck by the applicability of Maslow’s Hierarchy of Needs to the world around us. The general idea, for those of you not familiar, is that we all need certain basic needs met (food, water, shelter) before we can focus on our psychological needs (sense of belonging, sense of worth), and without those fundamental needs being met, it is quite difficult to dedicate any time to self-actualization – or achieving your highest potential. 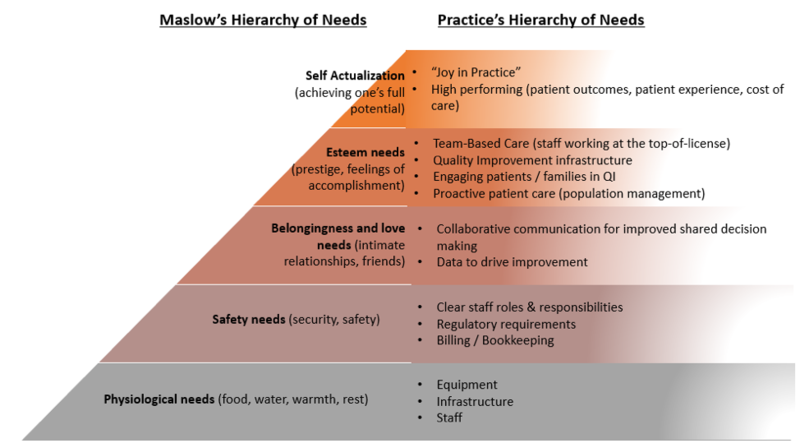 I have found myself returning time and time again to Maslow’s Hierarchy of Needs, particularly in the last few years as we’ve worked with our partners at the California Quality Collaborative (CQC) and Integrated Healthcare Associates (IHA) on our Practice Transformation Initiative. As I have worked with leadership and coaches to assess the readiness of their practices to engage in true transformation, we have talked a great deal about their hierarchy of needs, if you will. Some practices, for example, feel like they are in survival mode – meaning they don’t have their basic needs met. They are just trying to get through the day – to see their patients, figure out and meet regulatory requirements, and stay open. At the bottom of the pyramid, they might not have the staff in place or the resources they need to operate well. But as these practices get their basic needs meet, they move up the pyramid. They get their teams in place, then define roles and responsibilities for stronger team-based care; they start looking at data more regularly, then use those data to inform improvements; they update and standardize their operations; and they move from a place of reactive patient care to using population management practices; and ultimately they partner with patients differently – both in their own care and in the service of quality improvement. And by the time these elements are in place, a practice can start thinking about their team working to the top-of-license, “joy in practice,” and actually moving the needle on patient outcomes, patient experience, and total cost of care. So why does this matter? I would argue that when we truly understand where a practice is in its development, we can tailor our support to them in more meaningful ways. I have seen many practice coaches come into a practice and impose improvement activities without truly understanding the staff’s needs. This reminds me of how providers often tell patients what they need to do without truly understanding where they are starting and what they may still be working on. This may seem basic, but it’s only when we take the time to understand the readiness for transformation – of ourselves and those we love, of the practices we strive to help improve, or for our patients who might be facing massive deficits in their physiological and safety needs – that we can offer the most effective support. When we balance our agendas with the needs and the current resources and capabilities of those we support, we are far more likely to be successful… and perhaps attain true transformation for us all.